Reports suggest that 700 members of the clean-up staff were let go after just two days work. Glastonbury Festival organizers have clarified the status of staff employed to clean-up after this years event. The U.K. festival was the subject of a report in the Independent last week in which it was claimed that hundreds of people from Europe had traveled to the Somerset site only to be let go early after it became clear there was insufficient work. This change of plan reportedly left many people expecting two weeks of work stranded. Some complained of having not earned enough money to to recoup their expenses on travel, food and accommodation before they returned home to countries including Czech Republic, Poland, Spain, and Latvia. It is alleged that 700 staff were fired from zero-hours contracts, where the employer is not obliged to provide any minimum working hours. Labour leader Jeremy Corbyn, who spoke to a crowd of over 100,000 at the festival, condemned the festival following the report. He said there has been an "explosion" in insecure employment in the U.K. and suggested he was happy to raise the issue with festival organizers immediately. On July 5 Glastonbury issued a statement outlining the fact that workers are notified of the terms of their employment prior to beginning work. The statement adds that 2017 represented a particularly dry festival, making the clean-up process quicker than usual. 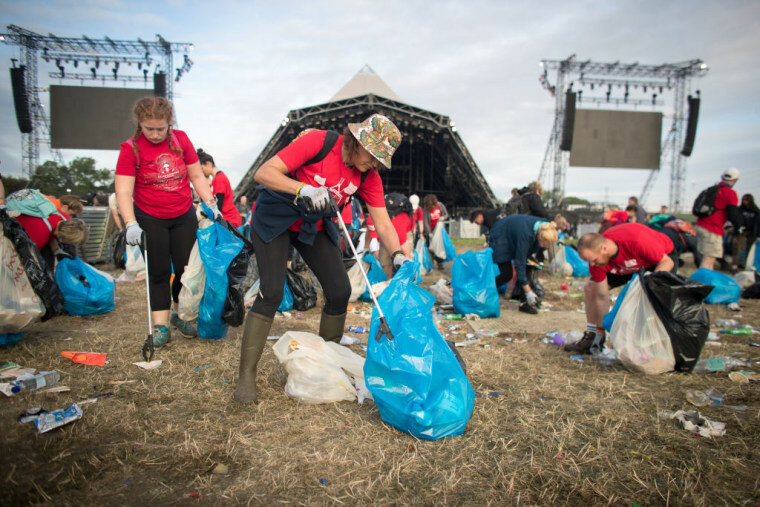 In response to recent stories in the media, we would like to state that Glastonbury Festival’s post-event litter picking team are all given temporary worker agreements for the duration of the clean-up. As well as being paid, they are provided with free meals and access to on-site facilities. The length of the clean-up varies considerably from year to year, based largely upon the weather conditions before, during and after the Festival. This is something the litter pickers – many of whom return year after year – are made aware of in their worker agreements (which assure them of a minimum of eight hours’ work). This year was an unusually dry one for Glastonbury. That, coupled with a fantastic effort from Festival goers in taking their belongings home, meant that the bulk of the litter picking work was completed after 2.5 days (in 2016, a very wet year, the equivalent period was around 10 days). All but a core crew of litter pickers were advised that there was no further work available after Friday (June 30). Those who weren’t able to leave the site over the weekend were given further meals, plus assistance with travel to nearby towns with public transport links. We’d like to thank the litter pickers for their work on the clean-up, which was – as always – hugely valued by the Festival. Glastonbury Festival took place between June 23-25 this year. It was headlined by Radiohead, Foo Fighters, and Ed Sheeran.